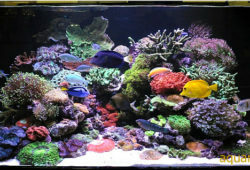 In the article I’m going to tell you about Easy invertebrates for the reef tank. Easy invertebrates might sound like a contradiction, but these inverts are the clowns and firefish to such Regal angel equivalents as Sea fans or Dendronephthya. Also, the inverts here are genuinely straightforward to keep. 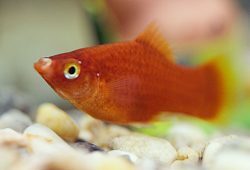 Keeping inverts is a slightly different art to keeping fish. With inverts, particularly corals and other sessile animals, environmental conditions (in terms of light, water flow and water chemistry) account for about 90% of their needs. The corals we’ll look at here are pretty flexible in their needs, which makes them much more accommodating about aquarium life. These are among the toughest of aquarium invertebrates. I have thriving colonies that have survived everything from overheating to metal poisoning, plagues of algae of various kinds and even immersion in cold freshwater during a flood. In some cases, I only intended to keep the rock that they had been growing on, but new polyps always seem to appear, growing up from unseen survivors. Their resilience is impressive, but this isn’t their only appeal – many of them look fantastic. Known as corallimorpharians, mushroom anemones are sold under a wide variety of names: mushroom polyps, anemone stones, elephant ears, polyp colonies or stones, or simply as mushrooms. Scientifically the picture is almost as confusing as few can be identified to species level. Thankfully, their care is similar for all. A mushroom anemone is basically a flat or undulating disc with a central mouth that may be raised slightly above the plane of the disc. The disc may be smooth or have rows of tentacles radiating from the mouth. Sometimes there are so many rows that the disc is covered, so the animal looks furry; in other forms the tentacles are just tiny raised dots. Both their size and colour vary tremendously; they may range from 2.5cm/1″ to 45cm/18″. They may be brown, blue, green, red, blue, purple, beige or yellowish, or a combination of these, and many are patterned with stripes, spots or marbling, or have contrasting tentacles. In the wild, they are common in less favourable areas where their tolerance of relatively poor conditions gives them an advantage. In the aquarium, most like good lighting and gentle water movement. They will tolerate relatively poor water quality (and often seem to do better in less-than-pristine conditions). Smaller mushroom polyps may be overgrown by hair algae, shaded and killed, though if the algae is cleared away, they can regenerate. Mushroom polyps associate well with each other in the aquarium. They look fantastic in groups, especially as they reproduce readily, usually by budding off small pieces of tissue which turn into new polyps. They look so good together that it’s worth setting up a tank just for them. A word of caution: do not keep the large “elephant ear” types, Amplexidiscus fenestrafer. Growing to 45cm/18′, they are fish eaters. Zoanthids, also known as button polyps, are attractive inverts that are surprisingly neglected considering how good they can look and how easy they are to keep. Zoanthid polyps resemble miniature sea anemones (the polyps are seldom more than 2.5cm/1″ in diameter), but they are usually found in large colonies. The majority of species kept in the aquarium have very short tentacles, giving them the appearance of buttons. In most colonies, the polyps are joined at the base but they may separate as they mature. They spread as new polyps bud off from mature ones. In the wild, they can cover large areas and will colonise new substrates in the aquarium. Zoanthids can be brilliantly coloured, often in metallic green or turquoise (fluorescent under actinic light), red, orange, or bright yellow. Others are shades of beige or brown, but with contrasting tentacle tips or markings in bright colours. They like intense light, although many will survive in less bright conditions. They like strong currents and may not expand their polyps if kept in water that is too still. Their final requirement is an absence of nuisance algae. Being small, they are vulnerable to overgrowth. They are not fussy about water quality and are more resilient to high temperatures. Coming from shallow water means that many can survive at temperatures over 38ºC/100.5ºF. As with most corals, scientific identification is tricky. However, most of the zoanthids on sale are Zoanthus species, like Z. sociatus and Z. pacificus. The typical brightly coloured colonies of large numbers of small polyps with short tentacles usually fit among these species. Smaller colonies with larger polyps may be the less colourful Palythoa or Protopalythoa. Finally, the distinctive long-stemmed, long-tentacled yellow zoanthids, usually found in small colonies with the individual polyps clearly separated from each other, are Parazoathus species. There is a downside. They secrete toxic substances for defence, and palytoxin from Palythoa and Protopalythoa species, which is a potent neurotoxin that is harmful to humans. Exercise extreme caution when handling them. In the aquarium, oddly enough, such toxins do not harm the other inhabitants. Leather corals are classic beginner’s inverts, and for good reason, but as with all the corals here, they aren’t popular just because they are easy. It was noticing the beauty of a single Sarcophyton standing among a mixture of stony corals and colourful mushroom anemones in my main reef tank that gave me the idea for this piece. That coral had grown up from a small offset that happened to be on a piece of rock. In isolation it looked great – the golden-green surface of its cap (technically a capitulum) densely packed with fine starry polyps. This self-sufficiency, growing quietly in the background, is one of the virtues of leather corals. Sub-optimal water quality, nuisance algae and less-than-perfect lighting don’t bother these corals much. In ideal conditions they will do better, but they look good whatever the circumstances. Optimal conditions mean quite intense lighting and strong water flow. The latter is more critical. They are very adaptable to light intensities. Their basic structure is simple – a column attached to the substrate with the capitulum from which the polyps arise. In most species, the capitulum is densely covered in polyps which have tentacles (often less than 1mm long) and fine stems. Most are buff to brown in colour, but shallow-water specimens may have a faint green iridescence, while some leathers from Fiji are a vivid yellow-green. In the aquarium they can be used in various ways. Large specimens make great centrepieces and smaller ones can be grouped to make attractive groves. Periodically, leather corals retract their polyps, deflate, and shed a mucoid skin. 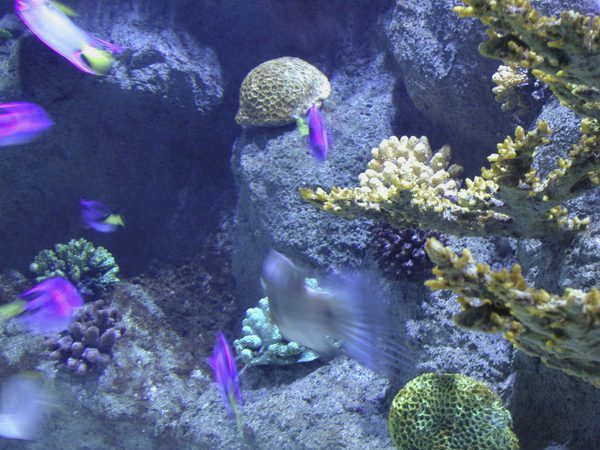 This removes the coral’s waste products and clears detritus from the surface. Shortly afterwards, the polyps re-emerge. Shedding varies but seems to be lower when the corals are kept in optimum conditions. It tends to happen for a day or so after introducing to an aquarium or in response to disturbances in water chemistry. Frequent shedding may indicate a water quality problem. Polyp retraction, without shedding, occurs at night and if fish or inverts settle on the coral. Caulastrea is another genus of attractive, hardy stony corals. They are found as large colonies, flat or dome-shaped, with dozens of polyps which, when fully expanded, hide the skeleton. This gives the coral the appearance of a large-polyped form like a Favia pineapple coral. When the polyps contract, the truth is revealed – the skeleton is branched rather than solid, with each branch bearing a polyp at the tip. Like many corals, Caulastrea have distinct feeding mechanisms. During the day, they swell to expose the maximum surface area to the light so that their zooxanthellae can photosynthesise. After dark, they deflate and produce long stinging tentacles to catch planktonic prey. There are at least three species of Caulastrea: C. curvata, C. furcata and C. echinulata. C. furcata is the most commonly imported species. It has green centres surrounded by a brown outer ring, sometimes with white radial lines. Other specimens can be a pale blue-green, sometimes with radial lines which tend to become more prominent when the coral is kept in brighter light. Caulastrea are widely distributed in the wild, from East Africa to the south central Pacific by way of the Indian Ocean and Japan. They are straightforward to keep – they need good, but not highly intense, lighting. 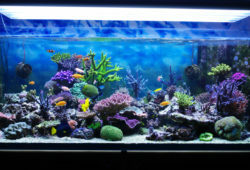 If kept in really bright tanks, position them in slightly shaded areas. Water flow should be moderate to strong and the calcium and alkalinity levels kept high. Caulastrea seem to tolerate less-than-pristine water. Under good conditions, they will grow quickly. I once bought one with seven polyps that in two years grew into a large dome with over 50 polyps. Since then it has been split many times. Captive propagation is particularly easy – a colony can be split by breaking apart the skeleton, with no risk of damage to any living tissue. Star polyps are so easy to grow and attractive that it’s almost impossible to believe that there are reef hobbyists who don’t have at least one colony. Few corals have their combination of resilience, growth, interesting form and vivid colour. A colony consists of small polyps that open from an encrusting mat (or stolon) and which spreads over the surface of a hard substrate. The stolon is usually purple or maroon. The polyps, typically 12mm/1/2″ in diameter, usually have an oral disc that is lighter than the rest of the coral, and eight slender, smooth or slightly toothed tentacles. The bright centres make a colony look like a collection of twinkling stars. The polyp colour is variable, but perhaps the most attractive has bright green tentacles with shiny pale green centres that fluoresce under actinic lighting. This form is probably Pachyclavularia violacea. In the aquarium, star polyps are some of the least fussy invertebrates. They will grow well under intense illumination or in relatively low light, in strong currents or in quiet, almost still water. They are not fussy about water quality, but can be overwhelmed by algae. They colonise rocks under good conditions, and will grow on bare glass. This is unusual as most corals prefer a coating of coralline algae! Large colonies can be grown by allowing them to spread unchecked, and they can even cover the bare base of a tank. Such large colonies look superb, with a field of waving, glowing green tentacles surrounding the brighter flowers of the oral discs. Star polyps are not aggressive corals. They may be damaged by other species, however, particularly stony corals with powerful stings. Pachyclavularia can easily be confused with Briareum, an encrusting gorgonian. But Briareum tend to form short, upright structures from the basal mat, which Pachyclavularia do not, and the mat is not usually so brightly coloured. Also, Briareum periodically shed sheets of mucus. However, there’s no need to worry if your star polyps turn out to be Briareum – they are just as nice and just as easy. This article was first published in the February 2004 issue of Practical Fishkeeping magazine.